Visiting card c.1890. The windows face South, one of the best views in Matlock. At the East end of the Drawing room is a stage. Unposted. 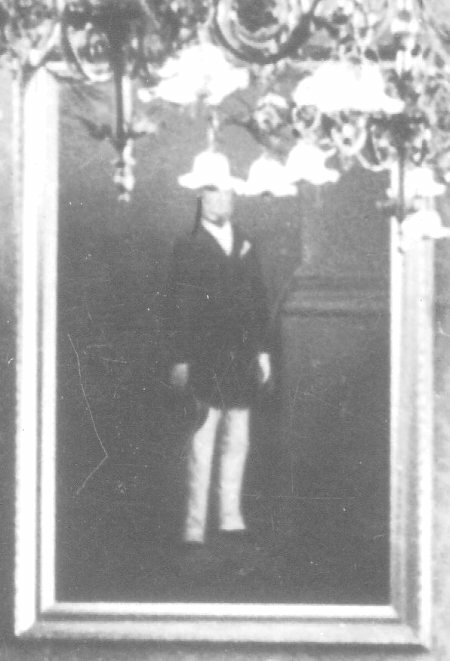 Photo taken from the stage at the East end of the Drawing room. The very large paintings at the far end of the room are believed to be of John Smedley (founder of the Hydro) and his wife Caroline. They were commissioned in 1896 (John died in 1875 and Caroline in 1892). Originally in the Dining room, they were moved to the Drawing Room in 1900. The carpet is one piece, and weighed a ton. How did they get it into the room? The height of the doorway nearby is 8 ft -(ref LSL Matlock)-, so the size of each painting (without frame) is 8 ft 9in x 5 ft 9 in wide. Anyone with information, please contact . The resolution is the best that the postcard and my scanner can produce. 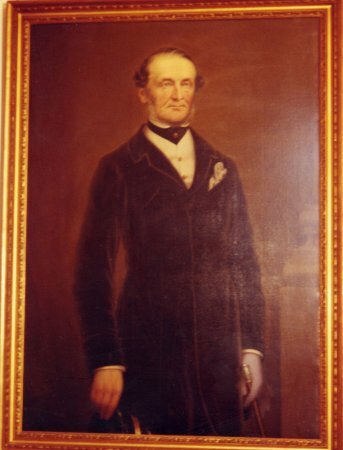 Fashion indicates the 1860s, but it is believed they were commissioned in 1896, when both were dead, so were the portraits made from photographs taken 30 years earlier?. LATEST It now seems that the 9 ft high portraits were cut down to 5 ft, reframed and now hang in Smedley's offices at Lea Mills. 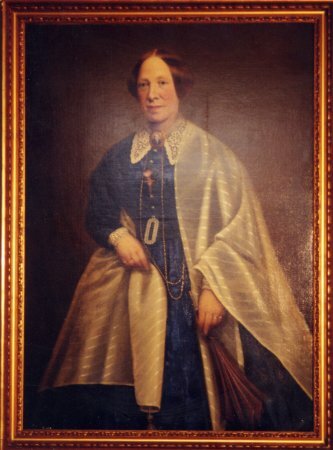 Pauline from Lea Mills very kindly sent me modern photos of these reduced portraits. Comparing the portraits reveals how the dastardly deed was done. The webmaster's wife spotted the crime before he did! What a tragedy that John's fashionable drainpipes and Caroline's spectacular crinoline have been lost to modern eyes. 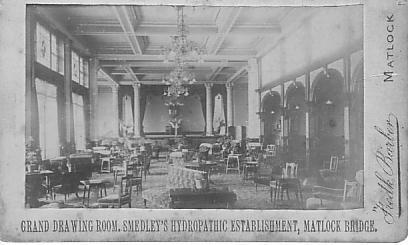 The drawing room at Smedley's Hydro was a spectacular place in 1888. In 1875 a limited Company was set up to run the Hydro, and extensive rebuilding carried out 1881-1886. A vivid description of the new Drawing Room appears in High Peak News 1888, together with some history of the foundation of the Hydro by John Smedley, 1803-1879, an altogether astonishing man, and his wife Caroline 1822-1892. 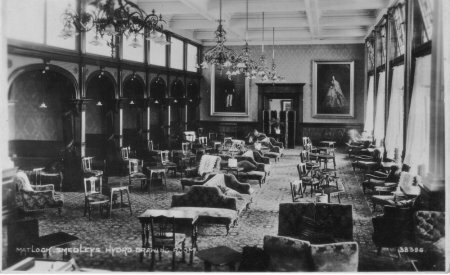 The author acquired two postcards of the Drawing Room, one of which shows two 9 ft high portraits of John and Caroline Smedley. 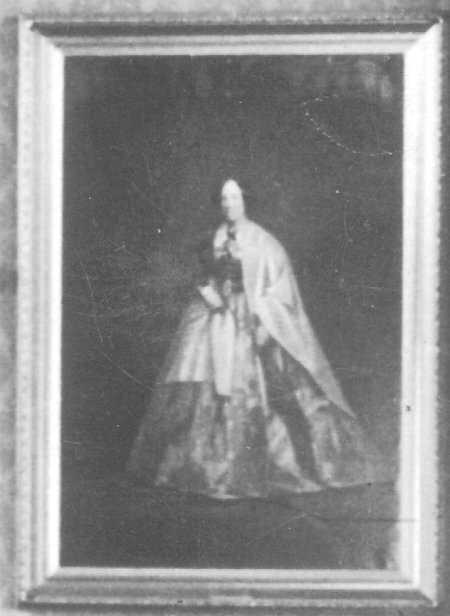 The Matlock Mercury has helped in locating these to the Lea Mills Boardroom today, but shortened to just 5 ft and perhaps restored (Caroline's crinoline seems somwhat darker today). From Matlock Mercury 12 Oct 2006. Have we found lost Smedley Picture? Matlock Mercury on 01629 762130 or email news@matlockmercury.co.uk.